It seems to be quite appropriate that the 2nd anniversary of the Blue Monster coincides with Steve Clayton’s birthday as Steve has been crucial in getting the Blue Monster where it is today. Hugh Macleod has a nice little write-up about the Blue Monster history, well worth reading. For me this story started at a similar time that I got to know both Hugh (we met for the first time at LeWeb 2 years ago) and Steve and that’s how I got affected by our little blue friend. It was good getting to know all three of them. Even more, the Blue Monster became an example of how companies can embrace social media. It has become an example of how a company (or anybody for that matter) can benefit from letting go of control. Just read through Rohit Bhargava’s “Personality Not Included” for instance, or the more recent “Crowd Surfing” from David Brain. 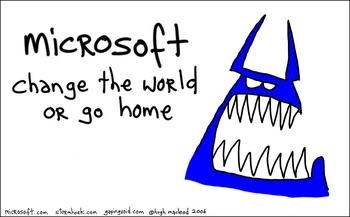 Hell no, the Blue Monster is not dead – it’s alive and kicking, not only within the spirit of many Microsoft employees but also outsiders are starting to see change. And did you read Hugh’s 7th point? Well the Blue Monster is going to Paris… but more on that soon ;) For now, it’s just happy birthday. thanks Kris – like you say, it’s alive and kicking!